Haviland and his wife, Anita, live on Deer Isle, where he serves on the boards of the Deer Isle-Stonington Historical Society and Island Heritage Trust. 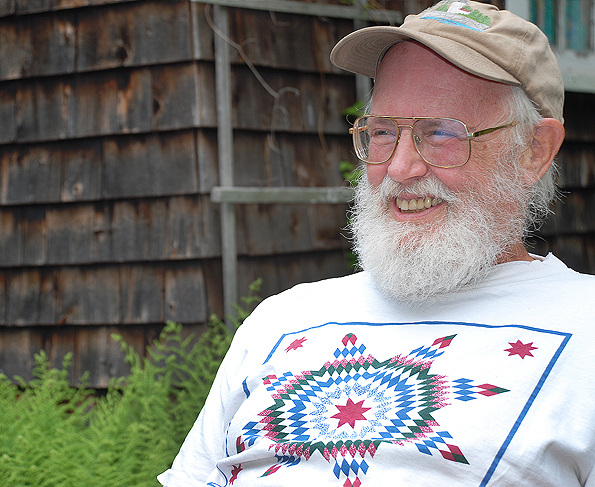 His environment and passion for anthropology led him to write, At the Place of the Lobsters and Crabs: Indian People and Deer Isle, Maine, 1605–2005. Published by Polar Bear and Company – available world wide. Photo: The bow paddler in the birch bark canoe is Bill Haviland. Steve Cayard, the builder, is in the stern. “As one encounters histories of Deer Isle, one gets the impression that, although Indians were here prior to the coming of William Greenlaw around 1760, since then, they have played no part in events unfolding on the island. The fact is, when the first Europeans arrived on the scene, the Indians did not conveniently disappear, but continued to frequent the place right down into the present century. My purpose here is to document their presence and activities over the past 400 years to offset the notion that Deer Isle’s history is exclusively that of Europeans and their descendants. The task is not easy, as information is usually fragmentary at best, and often tucked away in odd places. But, scrappy as it is, it affords us glimpses into the lives of Native people. Thus, it serves as a sequel to my booklet, Deer Isle’s Original People. Several things came together, quite by chance, that made this project possible. My memories of Deer Isle extend back into the late 1930s, and among them are memories of the Mitchells, the Penobscot family that regularly came to the island to sell baskets and other handcrafted items. Their ancestors are said to have always lived in the region ‘near the lobsters and crabs,’ hence the title of this book. I grew up aware as well of the presence of the many shell middens indicative of an ancient Indian presence. Throughout my schooling, Indians always fascinated me, and it was this that led me to anthropology. Ultimately, I spent over 45 years researching, teaching about, and working with various groups of this continent’s First Nations. “In the course of time, I have learned much, had the privilege of meeting some exceptional people, and formed important friendships. Among my activities over those years was a good deal of lecturing about the Indians of Vermont, testifying about Native rights in that state before legislative committees and in court, and publication of a major book with a colleague, Marjory Power, called The Original Vermonters. “As more and more people have become aware of my interests, several have shared anecdotes with me, along with various newspaper clippings, pages from scrapbooks, diary entries, and the like. At the same time, my collaboration with other anthropologists, especially my one-time student and late colleague, Jim Petersen, led me to the discovery of Deer Isle’s Indian canoe route, which I had the good fortune to explore from the water with Passamaquoddy historian Donald Soctomah. “The final catalyst came when my friends, colleagues and co-authors (of a textbook) Bunny McBride and Harald Prins, in 2003, undertook a project for the National Park Service to produce an historical-ethnographic overview of Native activity in and around Acadia National Park.